Offshore Oil & Gas (O&G) exploration is essential if the world’s demands are to be catered for. Despite strong public opinion, the majority of offshore industries recognise the importance of managing marine activities in an environmentally responsible manner. Getting the right, independent advice, at the right time is an effective way to achieve this. OSC comprises a multi-disciplinary team of highly qualified and industry-experienced marine scientists that offer advice and guidance on a range of topics associated with marine mammal mitigation and underwater noise. This can be achieved at high speed – by phone or email, or through pre-arranged, pre-project planning, and production of Marine Mammal Mitigation Plans (MMMP), desktop studies, literature reviews, reports and advice documents. If new to the ‘marine mammals and noise mitigation’ arena, and are unsure as to what your project requires, just give us a call +44(0)1368 865 722 or email info@osc.co.uk. We are quick to respond and are always happy to advise all stakeholders, client or non-client of the most likely suitable requirements. What can OSC advise me on? Any topic regarding marine mammals and underwater noise. OSC has over a decade of experience regarding existing legislation, regulations, and guidelines, and is up to date with all the latest research. OSC has access to a wealth of scientific information, and regularly conduct literature searches for all relevant published and unpublished sources of information. OSC also draws upon additional expertise from a pool of rigorously tested associate and independent professionals, as and when required. Mostly, we have the expertise in-house, but joint-bid with other organisations/companies on a regular basis. Advice documents collate information into concise, well presented and easy to understand documents that are tailored the needs of the client and the purpose of the project. OSC is a completely independent and privately-owned R&D company, so our reports and literature reviews are unbiased and balanced. All information and advice is based on scientific research, not emotion or public perception. Furthermore, our industry expertise means we understand what is practical and workable within industry, and apply this to all our activities to ensure advice is realistic, implementable and effective at reducing operational downtime without breaching guidelines. 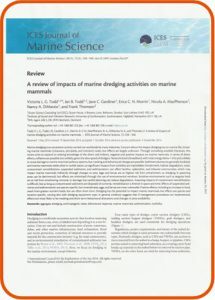 OSC has produced a peer-reviewed paper, published in the prestigious ICES Journal of Marine Science, on the known and predicted impacts of dredging on marine mammals. A comprehensive reference table detailing hearing ranges, habitat, regional distribution, and diet preferences of all marine mammals is provided as supplementary material, and can be used during planning stages and production of impact assessments. 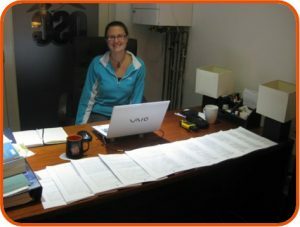 The paper and table are available to download here. The Marine Mammal Observer and Passive Acoustic Monitoring Handbook is an all-encompassing guide to marine mammal mitigation measures utilised during industrial activities (in particular, seismic exploration). The Handbook addresses a wide variety of topics and is a useful reference guide for all industry stakeholders. The Handbook is available to purchase from www.pelagic.co.uk or www.amazon.co.uk. Advice on marine mammal mitigation during unexploded ordnance (UK).